To season my goodies with missing flavours. Pinch me so I know it’s not a dream……. There are 8 weeks to the World Kitchen Gardeners Day.If you have a dream of your own kitchen garden, and have not been able to make a start, the coming 8 weeks are a good opportunity to take baby steps to step into the world of kitchen gardeners across the world! Join us ( a gang of crazy, passionate, lovable kitchen gardeners) at Urban Leaves on Sunday 3rd July at Maharashtra Nature Park at 8.00 - 9.00 am to learn the basics. During the coming 8 weeks Urban Leaves volunteers will hold your hand till you learn the ABC of gardening and proudly connect with the clan around the world on August 28th! Next 8 Sundays you will learn the most basic, simple, hands on, easy to use techniques ( no excuses left ) to start your own small kitchen garden. 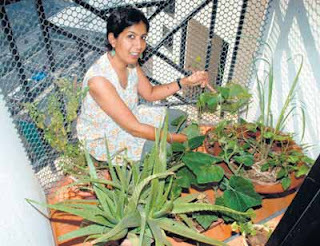 Just log in to www.urbanleavesinindia.com and follow your way to creating a kitchen garden. 5 baby steps to start your own kitchen garden. No registrations... No fees.... Just join us on a Sunday morning to soil your hands!